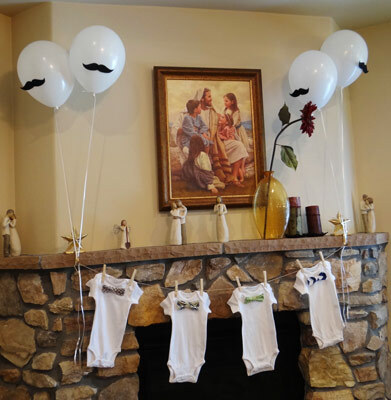 I jumped at the chance to help with the decorations when I found out my friends were throwing a baby shower for a dear neighbor who was pregnant with her first child. 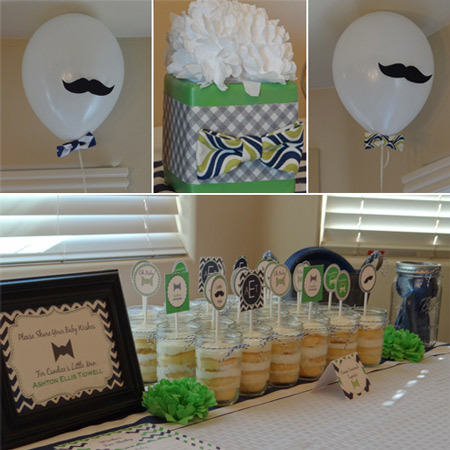 Since it was a boy, I knew the perfect theme would be a "little man baby shower". 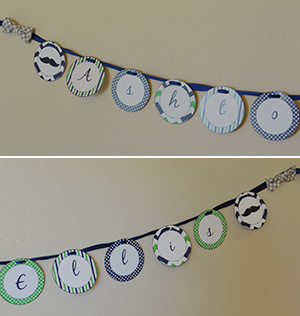 I chose a mixture of bow ties and mustaches for a fun and playful party. One of my favorite elements of the party also doubled as a baby gift for the mom to be. I made a onesie clothesline with bow ties that snap in place. So she can actually change out the bow tie when she wants a different look and as the baby grows older, she can continue to use the bow ties with larger onesies. This little baby is going to be one fashionable dude! 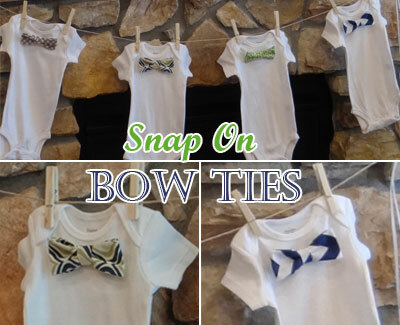 I put together a step by step tutorial to help you make your own snap on bow tie onesies. 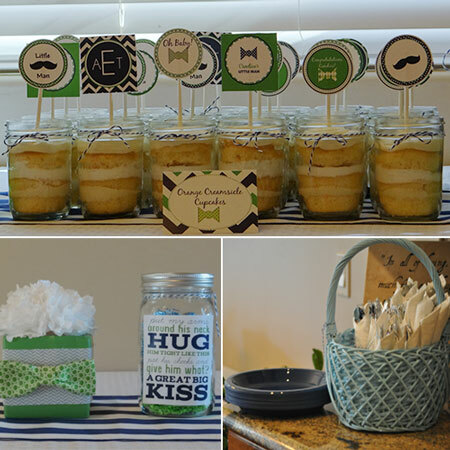 I also carried the bow ties and mustaches throughout the baby shower decor. The balloons were another one of my favorite touches. I love how they looked all dressed up with their mustaches and ties! For the centerpieces, I found some square vases at Michaels on Christmas clearance and spray painted them to match the colors of the party. Then I added 3 paper napkin flowers to the top of the vase and then used coordinating fabrics and bow ties to dress up the fronts. The table runners were actually made from a yard of fabric that I cut in half and sewed the ends together to make it long enough to stretch across the table. I originally intended it to be for only one table. But when I was measuring it out I realized it was way too wide for a table runner. Rather than cut a whole bunch off the width, I decided to cut it in half again and turn it into 2 table runners. It worked beautifully! 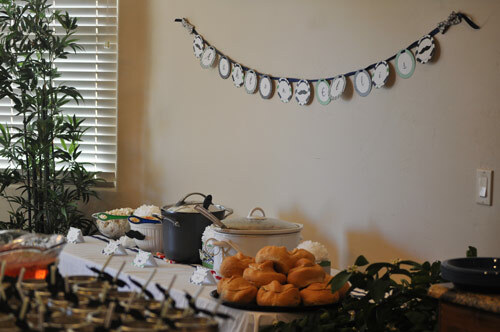 I used more paper napkins along the tables for decorations and made tissue pom poms to hang over the tables. We decided it would be fun to have cards for the guests to write their wishes for the baby. This was the card I came up with. 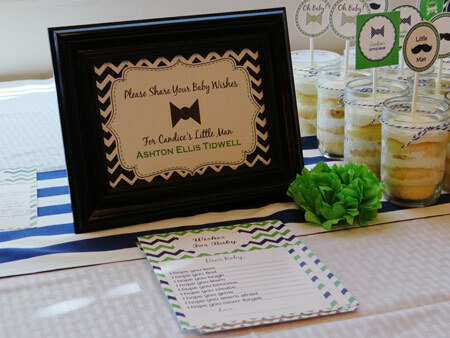 It was fun for the guests to fill out and the mom-to-be can keep the cards as a keepsake from the party. We had served a light brunch with the open house. We served ham and cheese soup and pasta e fagioli soup. We also had bow tie pasta salad (of course) and Dixie fruit salad. For drinks, we had cherry 7 up with maraschino cherries and limes. 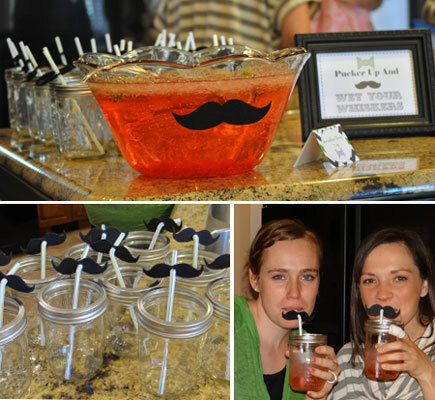 It was served in mason jars with mustache straws. Lots of fun! The dessert was Orange Creamsicle Cupcakes. They were divine! Here's the recipe we used. We also had a jar of chocolate kisses for a guessing activity. 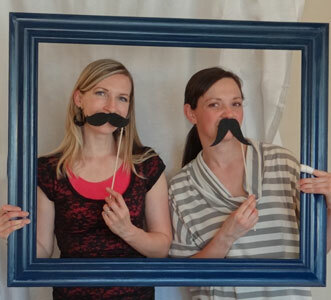 We put together a fun photo booth to go with theme. 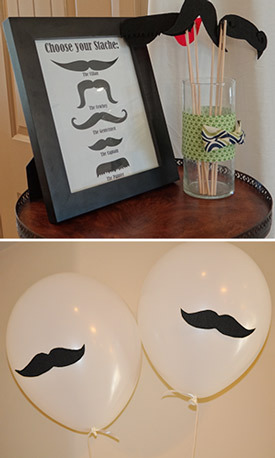 There were all kinds of fun mustaches for people to use. I used a white sheet as the backdrop and my cute hubby made me a frame that was large enough for at least 2 people to fit in. Love my handy man! 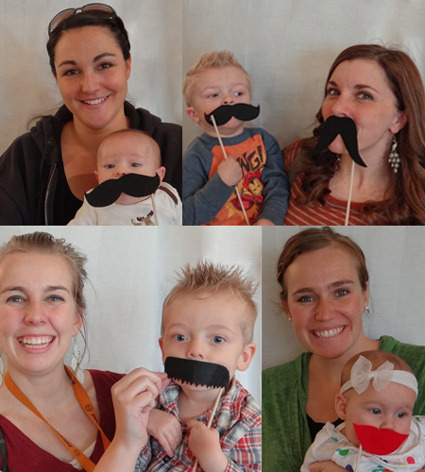 Our littlest party guests were the most adorable part of the photo booth. I loved all of their cute photos! 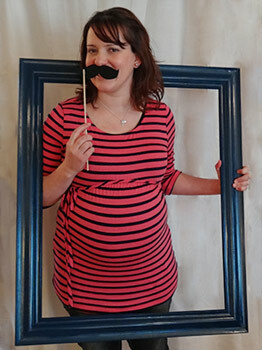 And our most important guest...the cute mom-to-be! 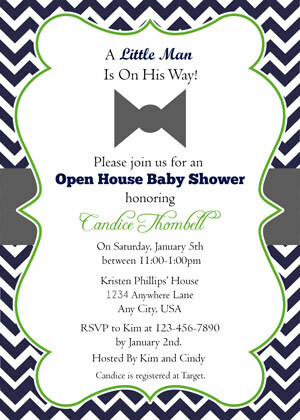 I made the invitation using Adobe Photoshop. What did you use to create the invitation?